Amazon Kindle DX has gotten a facelift. The new Amazon Kindle DX ebook reader comes with an improved display, boasting of better contrast, which will offer a better reading experience. The New Kindle DX comes with social networking integration with FaceBook and Twitter, plus a more stylish look. Despite the improvements, the new Kindle DX ebook reader comes with a price drop. From $489, Amazon has dropped the price of the latest Kindle DX ebook reader to $379, a move that will make it compete better with Apple iPad. This follows a similar price drop for the original Kindle ebook reader from $259 to $189. The latest Kindle DX is currently available at Amazon.com. Amazon have also unveiled the latest generation of Kindle ebook reader, with 3G and built-in Wi-Fi and and Wi-Fi only models. The New Kindle DX features an upgraded display. Although the display is still black and white and retains resolution of 1200 x 824 pixels, it now offers improved contrast of 10:1. The improved contrast will make the display sharper than ever, offering improved reading for your books and personal documents. Amazon Kindle DX is the bigger Kindle ebook reader offering a larger display, more storage, and an easy to use keyboard. It comes with a 9.7-inch E-Ink electronic paper display with a resolution of 1200 x 824 pixels at 150 ppi. Amazon Kindle DX reads just like real paper. 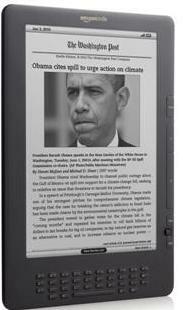 With 16 shades of grey and now 10:1, Kindle DX ebook reader displays sharper and clearer images, text and photos. Amazon Kindle DX display reflects light like ordinary paper with no backlight and hence mild on the eye. Kindle DX reads in Sunlight with no glare. With Amazon Kindle DX ebook reader there is no monthly wireless bills to worry about, all you pay for is the Kindle ebook you are downloading. Think of a book and you can have it delivered within minutes. Owners of Kindle DX ebook readers can also download Kindle ebooks wirelessly free outside their home country, except for customers in the United States, who will pay when downloading abroad. Amazon Kindle DX ebook reader can hold up to 3500 ebooks. At the Amazon Kindle store you have over 600,000 Kindle books to choose from including 109 out of 112 New York Times Bestsellers as well as top newspapers, magazines, and blogs. Over 1.8 million free, out-of-copyright, pre-1923 books are also available to read on Kindle. Kindle ebook reader now fully supports PDF, meaning you can read all those personal documents on Kindle reader. Kindle DX ebook reader is now integrated to social media. Readers can now share their passion for books and reading with friends, family, and other readers around the world by posting meaningful passages to social networks like Facebook and Twitter directly from Kindle ebook reader. Amazon has discontinued the US only Kindle DX ebook reader, but they are still available as second-hand items. Amazon Kindle DX ebook reader is available for order, for current prices, reviews, specification, and features of this wonderful electronic reader, visit Amazon.com. You can also buy Amazon Kindle ebook reader at the store.